In Romans 15:12 the apostle Paul quotes the prophet Isaiah saying, “There shall come the root of Jesse, and He who arises to rule over the Gentiles, in Him shall the Gentiles hope.” Jesse was the father of King David. And from David’s line, Christ would come. The large root in this piece represents Christ. Surrounding Christ is the sea of humanity, represented by thousands of twigs. Each twig is broken, as is each of us. The jagged edges and sharp points represent our sin. The smoothness of the root represents the perfection of Christ. And yet the root is cracked. For Christ was tortured and physically broken, taking on our sin. And in Him, and only in Him, is salvation and the forgiveness of sin. The format of this piece came from an idea I had in college, many moons ago. I wanted to experiment with pointillism, using pieces of wood instead of paint dots. Back then, I planned on using small sections of dowel rods. But because of the size of today’s piece (and the emptiness of today’s wallet), I decided to go a more natural (and cheaper) route. I would use sticks gathered in the yard and the neighboring woods. How many sticks would I need? That of course depends on the amount of space I needed to fill. I had come across an old rusted wagon wheel rim half buried in the woods. After extracting it and scrubbing it down, I calculated its area. I then calculated the area of one Amazon shipping box. 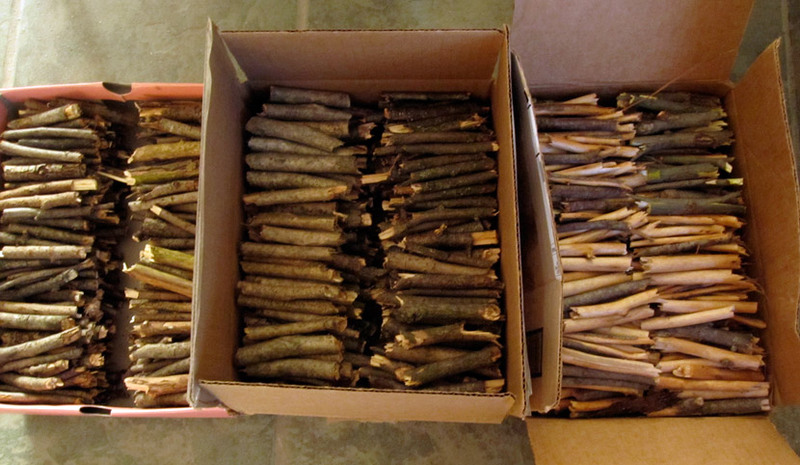 A little more math led me to determine that I would need seventeen boxes filled with twigs. Each twig would need to be between 3 and 4 inches in length and each had to be broken to size by hand. If anything was too large or strong to break, it was rejected. Thousands of twigs were collected into boxes. What to use? I knew I wanted a cross section of a stump. And I wanted a piece that was very low to the ground, where you could see the shapes of the main roots starting to extend from the main trunk. My father is a tree trimmer and cuts down many trees per week. I described my need and asked him to keep his eyes open. He showed me a very strangely-shaped piece that he’s had in his shop for many years and asked if it might work. 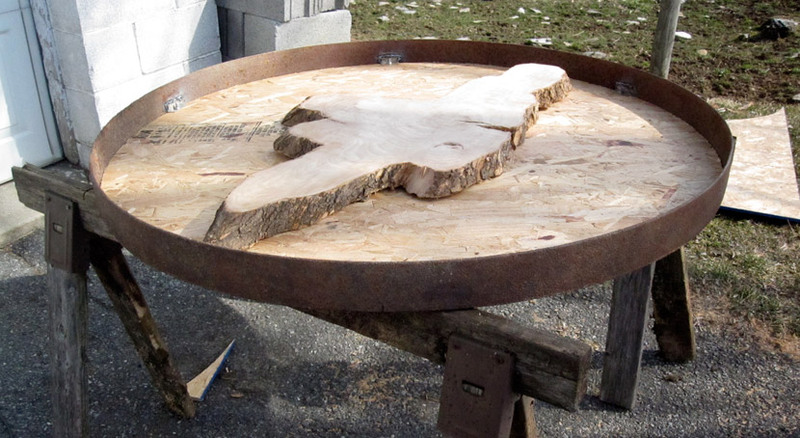 It was an old piece of elm, a species not as common today due to the devastation of Dutch elm disease. It had four very pronounced root sections with two on opposing sides sticking out quite far. It was odd and I told him it was probably too irregular. Plus it was cracked, as wood will do when it dries. It took a few days, but I slowly came around to the realization that this irregular piece of wood may be the perfect fit. 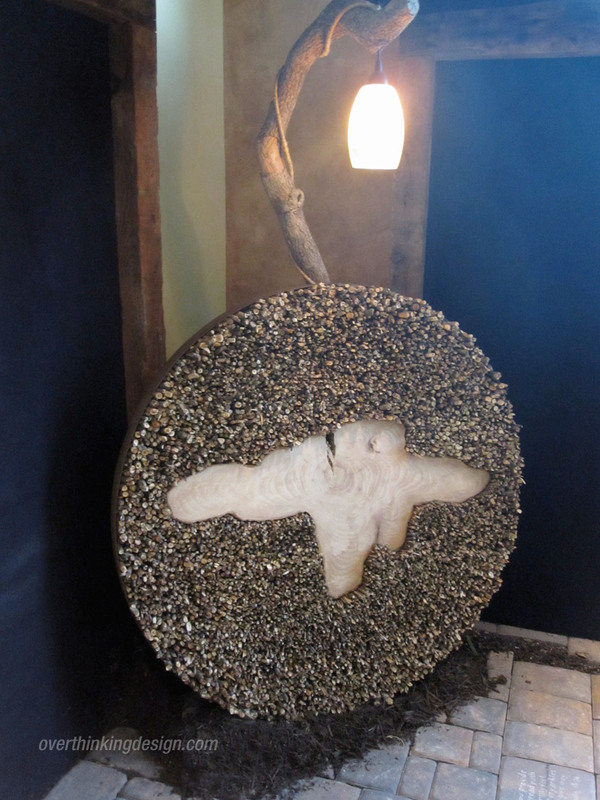 After all, this piece represents Christ, who was pierced for our transgressions. The crack in the wood made perfect sense. And the two outstretch roots symbolized Christ’s outstretched arms on the cross. It was all coming together and the assembly could now begin, with some help from my dad. The first step was to make the piece of elm as smooth as possible. Naturally, it had been cut by a chain saw, which left the surface ragged. We borrowed an electric planer from a friend of my brother-in-law. It made short work of the task—an absolutely amazing tool. 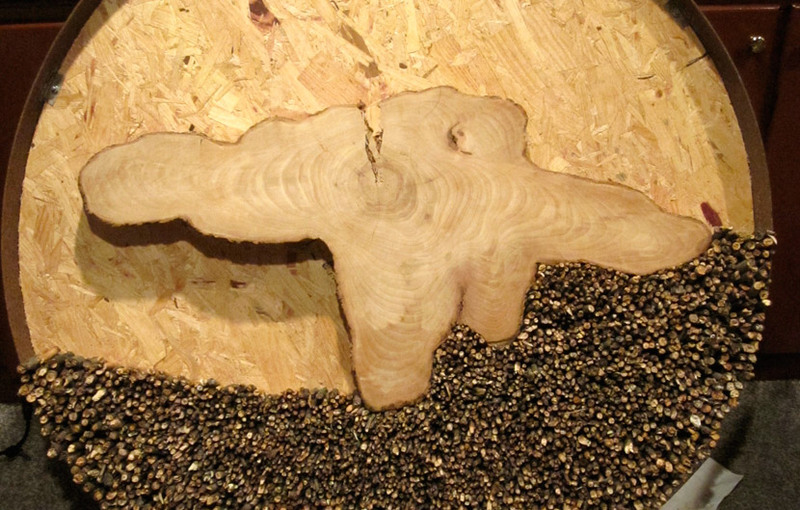 We then broke out the belt sander and before long we had one smooth piece of elm wood. 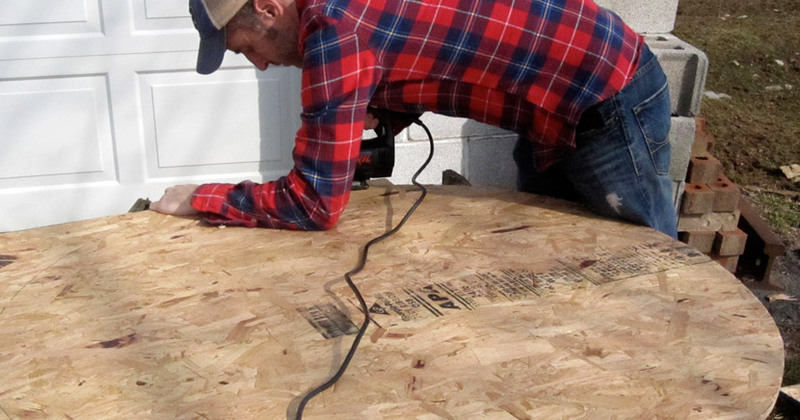 Electric planers are amazing tools. Next we cut a circular backing backing board out of plywood, which was screwed onto fasteners that Dad welded onto the inside of the wagon wheel. We then broke out some heavy duty screws and screwed the root onto the backing board from the back. With that complete, I thanked Dad and headed home to begin the process of placing the twigs. The new challenge was determining the best procedure for placing the twigs. At first I tried it with the wheel flat on the ground. I created triangular shapes out of card stock, planning to fill one section at a time. But that didn’t offer the stability I needed. For this piece to work, the pieces needed to be tightly-stacked and fitted together. I leaned it up against some cabinets in my basement, and starting from the bottom, placed each twig—one by one. The pieces had to be tight. I couldn’t simply take a handful at a time, letting them settle together. Each piece was placed with care in a location where it fit snugly. Near the edges, I used twigs with a larger diameter. The smallest pieces were placed near the center. Every so often I would lay down a thick line of wood glue along the base of the exposed row. The glue would spread down the back of the board. In the end, I suspect only a fraction of the pieces were actually glued to the board. But the hope was that enough of them would be to help hold the rest of the pieces in place. I didn’t keep track, but I estimate this final process took between 15 and 20 hours. 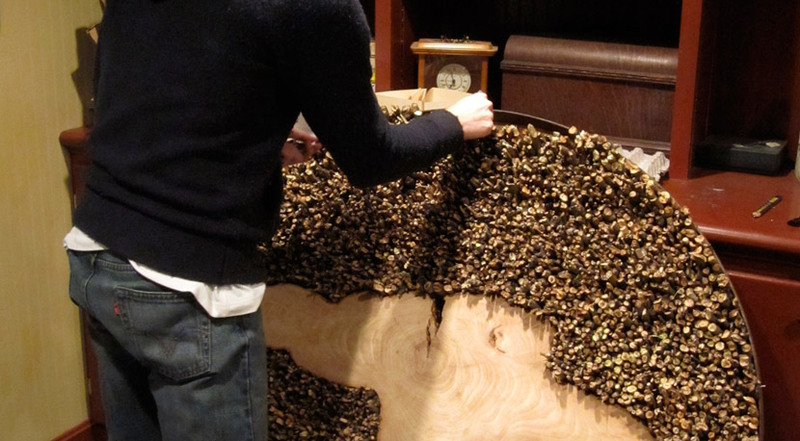 I also estimate the piece uses over 12,000 twigs. I am very happy with the final product, but the process was even more of a joy. For much of the time spent gathering and snapping twigs was spent in prayer—prayer about the piece and prayer for those who would view it. Plus I was able to work with my father, and that’s always a joy. Much of my creative problem solving I learned from him. And is it heavy? You bet. It’s just heavy enough that I’m unable to lift it. Today, after being displayed in two shows, it sits in my basement. I hope one day that it will find the perfect home. For now I’m glad it’s in mine.